Had the engine in my 29 Pontiac rebuilt and now it leaks lots of oil from the front crank pulley. Being a 29 it only has a slinger and not a seal. The manual says to pay particular attention to orientation of oil squirter and gasket thickness but doesn't give specific information on either. I have a cork gasket on the timing cover now which I think might be too think. Can anyone help out with further information? I am not sure if this the correct number as I can't access my parts book right now, but this is the style of seal you need. The side you see goes against the crank gear and rotates with it. The opposite side (cork ring) rides against the timing cover and seals everything. 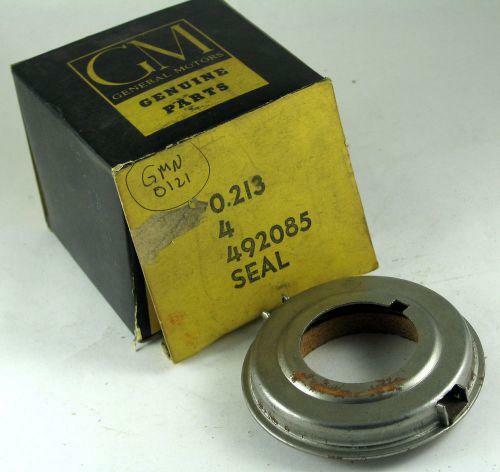 Many GM's used a seal like thus up into the late fourties in at least three diameters. If I can I will post the correct part number tomorrow. Is that slinger on backwards? It looks like it would toss the oil forward not back to the pan. Interesting, you are right according to the parts book. The 29 I had apart was the same as the 30. Perhaps the engine or the cover had been changed in the past. Should/is there a drain hole in the bottom of the ring in the cover that is blocked? In the eighties the man that redid my bearings brazed a tube onto the inside of the front cover and used a modern lip seal that ran on the front of the crank. It seemed to work okay. I wanted to go back to the original but he had messed up the cover so I just replaced the modern seal when I did my engine the last time. The VW air cooled engines also use a oil slinger. I have seen those turn around backwards...….What a mess! Is your road draft tube clear? Is it possible that your crankcase is pressurized enough to restrict the draining back into the crankcase? Slingers are pretty simple. Your drain holes back into the crankcase are too big to clog. Is it possible that there is a restriction in the oil line somewhere that is causing extra oil to flow into the timing gear area? Thinking about your problem and wishing you well. I can blow through the draft tube with no restriction whatsoever, I'm confident the crank case isn't getting pressurised. A restriction elsewhere is possible I suppose, I did 250 miles in the car the weekend before last though, I think oil starvation elsewhere would have shown symptoms. I pulled the timing cover on the weekend and installed a much thinner gasket, made no difference. 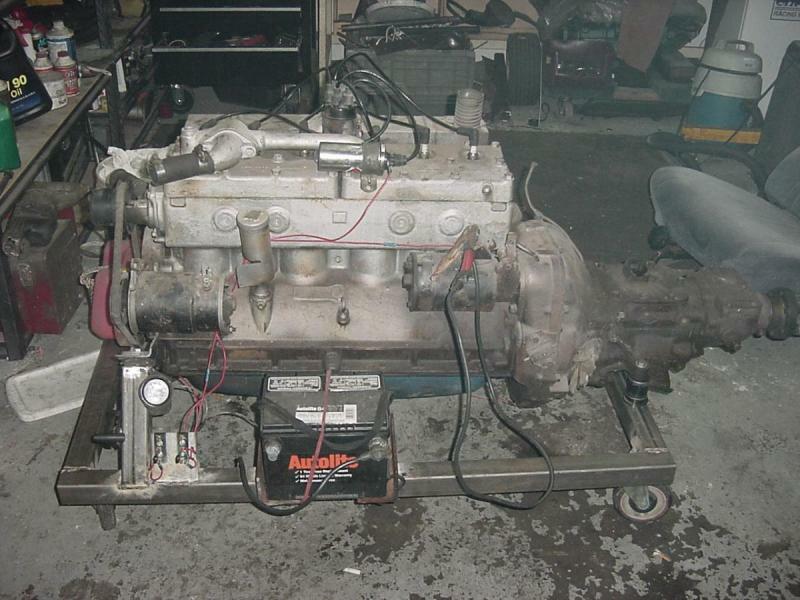 If I can find a 1930-32 seal assembly I'll modify a timing cover to suit. If you can look up that part number for me it would be a big help Reid. Refer back to the picture. Several suppliers sell the seal but it is merely the cork insert. Make sure you get the spring loaded metal part as well as the cork. It might be simpler to get a modern seal that would press into the trough on your cover and run on the crankshaft??? I hope your wrong. The road draft crankcase ventilation is the pressure/suction type. Pressure from the oil fill breather / suction from the road draft tube hung just below the chassis ( usually the tube is cut at a angle to help induce more low pressure suction some have a filter like Pontiac). What I find most alarming going to car shows and finding a old Pontiac flathead is two things. One, the breather cap and it's wire mesh are dirty and also disturbing is the "scoop" on the breather is pointing backwards and gets no air stream from the engine fan to pressurize the system. Also what is forgot while doing a oil change is cleaning the breather cap with it's wire mesh, and once it's clean filling it with 10W oil and letting it drain out, this oil film coats the wire mesh so dirt in the air will cling to it and not go into the engine. Cleaning the breather cap and road draft filter are part of every oil change and as the engine gets older it becomes more and more necessary because of more blow-by gasses happens with wear as a natural occurrence. Thanks, I’ll start the search. Ive thought of a modern lip seal but it would need to run on the snout of the balancer, this would need machining to provide a suitable surface and give enough clearance, I’m concerned this would remove a lot of strength and lead to possible failure. "I'm confident the crank case isn't getting pressurized"
On split head Pontiac engines after Series 6-27 it is not physically possible to install the oil filler pipe backwards. It is designed so the airflow from the fan and forward motion is directed into the crankcase. See attached photo. That's true of the later sixes and straight eight's too because there is a groove to index the breather/air scoop, however if there is a will there is a way and some people put the breather on the filler neck any way they see fit. I once told a guy at a car show his was on backwards. When he tried to remove it , it took some doing to get it off. I have seen other Pontiac engines with the wrong breather that doesn't have the air scoop so there is no air pressure to the crankcase. The aussiecowboy and I were specifically discussing the Series 6-29A and series 6-30B Pontiacs which have engines entirely different than the ones you are talking about. On our engines the scoop is impossible to mount backwards and the cap is a plain cap, just like a gas filler cap but unvented. I guess, however Pontiac and other manufacturers refer the road draft system as a "Pressure Suction" crankcase devise even though there is little pressure from air from the engine fan. This may or may not pertain but thought I'd relate my experience. As I've been going through my '30 I've been replacing seals and whenever possible, with modern versions. Tried that on the timing cover also but noticed a leak so took it apart again and replaced the modern version with the cork version from Olson Gaskets. Still leaked. Tore it down again and realized that there was no oil around the pulley or the hole where the crank comes through. Pretty sure it was the cover gasket. I left the cork gasket in and added a second gasket to the cover (I see that may be a no-no) and so far no leaks. It hasn't run for more than several minutes so I can't swear it's ok but my fingers are crossed.